Another new week! The days are going by so quick and January is almost over. My weekend was quite relaxing. I spent part of my Saturday studying after work and getting back into the hang of school. I was so exhausted from a long week that I pretty much stayed home after church on Sunday catching up on shows like '90210' and 'The Real Housewives'. Later in the evening, I watched the SAG Awards' red carpet, while tweeting my thoughts on the styles. When I got to work, some of my coworkers could barely recognize me because most of them have never seen me in braids. Do I really look different? Enjoy the rest of your week! love love braids on you. You do look kinda different. You look more sleek which is weird cause braids normally make people look younger but it makes you look sophisticated. LOVE these pants... you look gorge! girl I love the hair! it looks really good on you and it brings out your face ...those zara pants are hawt! cute outfit! Stella doll you look stunning. The red blazer is just gorgeous on you. Love the pants and your bag!! great style!!! p.s. i enjoyed your tweets during the red carpet on sunday! I love you hair and the outfit too. Oh how I love '90210'! Love the outfit. The shoes and pants especially! 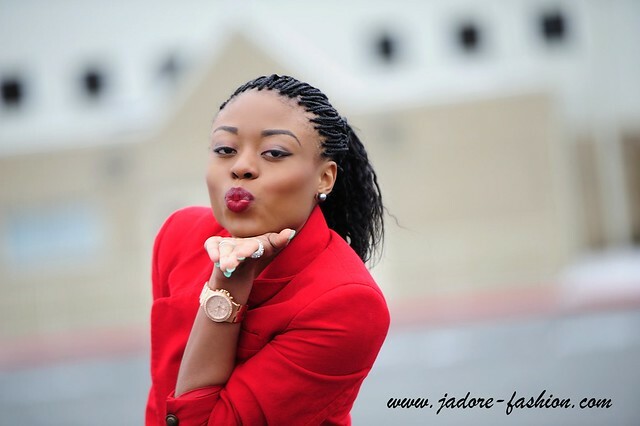 Finally Stella Uzo in braids...stellar! 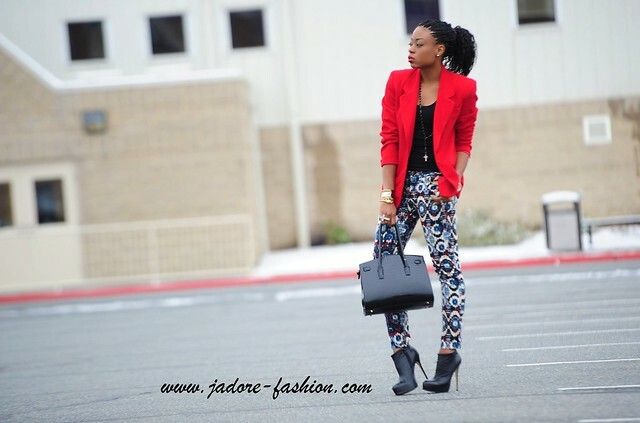 i love the blazer and print of your pants..awesome combo! Those pants are awesome! I love your hair!! My best friend gets her hair braided sometimes and it's always my favorite! j'adore ta tenue, tout me plaît. 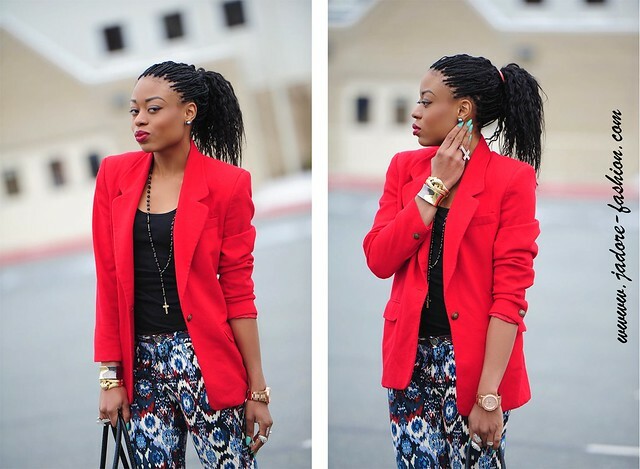 I like the print on the pants and the bold red blazer, you look cute in the braids. I don't think you look that different but you do look really pretty :) I love your pants, lipstick and nails! I wish I could rock that shape and that color is gooorge. i love your new hairstyle you look gorgeous. Love these pants and this whole outfit. I would love to dig all in your closet. I love the combination of pop of color with patterned pants. You love wonderful hun!!! You look fabulous! I missed the SAG awards. I so want some print pants. Especially for Spring. beautiful outfit head to toe. the red outfit is perfect for those pants. In my opinion (and I can't believe I'm writing it) you look even better with braides! I loove your pants! oh i wanted to buy the same pants darling but they aren´t available any more here :( you look gorgous! WAUW! Great style and looks! Love it! Start following you. omg, i love your style! gorgeous! Amazing look, darling! Those pants are so cool. And I love your hair! i love the braids!! lol u do look different!! i havent braided my hair in years because i cant sit still for that long lol! i Love ur red blazer and your pants everything!! OMG! I want your braids! Looks awesome! Those pants are evil :) Loooove the look. Looking amazing. You are really rock'n this outfit! Love this. Such amazing details. Great nail polish too. I think just about any hairstyle will suite your beautiful face...work it! I fell in love with your boots, a high heel lover as I am. They give you such a nice gait and support your shapely figure so majestically. Love the new hair style! And those pants with the mint green nails! Love! you look phenomenal ... i love your style! 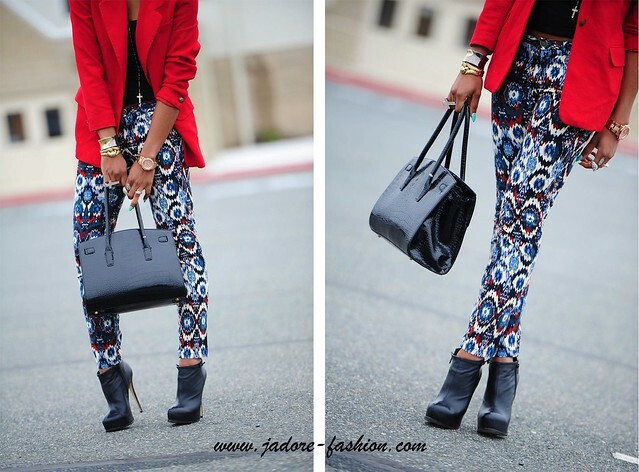 I am obsessed with your booties and red blazer! They are so gorgeous and perfect for this time of year (fall/ winter!) I think a good blazer is key, one that is neutral, and then one fun one- like your red! 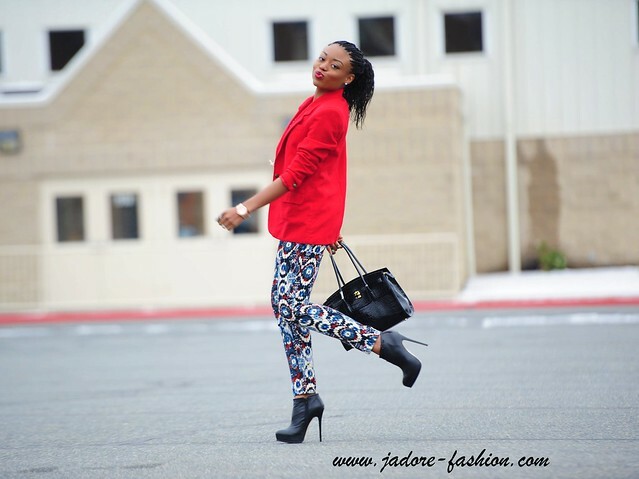 I am an official follower of Jadore-Fashion and would love for you to follow my blog as well! The design on these pants are haute! You don't look different at all but some people can be so dramatic, lol. Your eyebrows are fab! wow!!! your hair, i got so used to seeing in you in bangs. nice, nice and am loving that red blazer! Thanx for your lovely comment...You look great ! Wanna follow each other with GFC, Twitter and Facebook ? great look. i really love those pants. thanks so much for your sweet comment on my blog too. LOVE those pants the print is perfection!!!! Love your outfit. And your nailpolish. Wonderful photos, I like them!!! This is such a nice post! Take a look and if you want we can follow each others: Cosa mi metto??? Red blazer love! It's so perfect. I have been dying for one like this. i would kill for those pants... end off! Really your look very nice. Nice photos and really cool outfit, you look great, I like your pants, what a great print and that jacket is so nice, the perfect touch to the outfit also you are really beautiful and your shoes rock! You have an awesome blog by the way and I am a new follower on GFC and Bloglovin! Hope you will like my blog and follow back! Love the braids! I just got my hair braided also. Those pants look great on you. Sad I couldn't find my size in Zara. oh.it's nice blog.your choosing nice pics for Clothing and Fashion.black dress model is very cute. 1. Thank the person that nominated you, and give a shout out on your blog with a link to theirs. 2. Share 7 random facts about yourself. 3. Send the blog award to 15 other bloggers whose blog you love and appreciate and let them know they won the award. It seems like I missed so much! I love your hair. Love your Navajo Pants. You do look different. Different, but beautiful in your braids. Love it. Nice jacket too. Great find. There´s an award in my blog for you darling! c 2008-2012. Powered by Blogger.